Jack Nicklaus holds the trophy after winning his fourth PGA title at the Firestone Country Club in Akron Ohio on August 10, 1975. One came at a zenith and arguably the most dominant period in the storied career of Jack Nicklaus. The other came when the media began to question how much the Golden Bear had left in his championship gas tank, only to learn that Jack was back and that 40 was just a number and not an expiration date on golf’s greatest career. Of all the many accolades and records associated with the career of Jack Nicklaus, one of the most impressive is his record-tying five PGA Championship titles—a total equaling the great Walter Hagen. And if looking for a crowning moment in the PGA Championship legacy of the Golden Bear, look no further than the calendar and August 10. 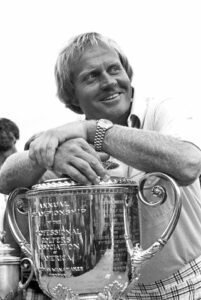 With his victory on Aug. 10, 1975, at Firestone in his home state of Ohio, Nicklaus won PGA Championship title No. 4. It also was his record-extending 15th major championship title—a raising of the bar he set, when he passed Bob Jones’ record mark, fittingly, at the 1973 PGA Championship. The PGA Championship exclamation point for Nicklaus—who in 2016 celebrated his 50th year as a PGA Professional—came on Aug. 10, 1980, when a 40-year-old Golden Bear was brilliantly dominating at Oak Hill to win his fifth PGA crown and 17th major. As we all know, and still celebrate, major championship No. 18 would come six years later at Augusta National when Nicklaus donned his record sixth Green Jacket to punctuate a championship career in which he won over a 25-year period. When Nicklaus came to Firestone in 1975, he had already become a member of an elite club of career “Grand Slam” winners, with his multiple victories across all four major championships. But Nicklaus was and is not the reflective type, so heading into the second week of August 1975, he was focused on the week at hand. There was winning yet to do. The 1975 PGA Championship brought Nicklaus back to his native Ohio, where he was the “hometown” favorite—and to a layout where Nicklaus won seven times during his career. The steely-eyed competitor had a great comfortableness with the golf course. We already know what he decided. Worried as he was about the potential for a Monday playoff, it was clear by his performance that the Golden Bear would be back in Columbus Monday for the Columbus Pro-Am with his 15th major. With opening rounds of 70 and 68, Nicklaus found himself three shots behind Bruce Crampton, whose second-round 63 was the lowest round ever in the Championship. But on Saturday, Nicklaus had a 67, while Crampton soared to 75 for an eight-shot swing, giving Nicklaus a four-shot lead going into the final round. That Sunday, Nicklaus cruised to a 71 for a two-shot victory over runner-up Crampton, pushing his string of PGA Championship victories to four—one shy of Walter Hagen’s record. The shot so many, including Nicklaus, still remember is a 9-iron he hit over a 30-foot-tall tree, over a pond, and to a pin 137 yards that set up a crucial birdie. In 1980, August 10th would again be good to the Golden Bear. He dominated the field at Oak Hill for a record-shattering PGA Championship victory. Nicklaus went into the PGA Championship confident after shooting 65 in his final practice round, including an ace on No. 15. The Golden Bear shot rounds of 70-69-66-69. The field averaged 74.6 strokes, while he averaged 68.5. Not only did Nicklaus tie Walter Hagen with his fifth PGA crown, he did so with a seven-shot win over Andy Bean—then the largest margin of victory since the PGA went to stroke play in 1958. It was the fifth time Jack Nicklaus won two major championships in the same year and he became only the third golfer to win the U.S. Open and PGA in the same year (Gene Sarazen and Ben Hogan were the others).